06-Mar O Binder Ostheim Ostheim Local 13:16 13:40 0:24 0 First flight and C of A Test flight by Oliver Binder. 06-Mar O Binder Rob Ostheim Ostheim Local 14:02 14:45 0:43 0 Strong SW'ly on wet snow, a couple of weak thermals but mainly confirmation of 13's handling and engine performance. Satisfactory and some. 06-Mar Rob Steve Ostheim Ostheim Local 15:05 15:25 0:20 0 First taste of 13 for Steve. 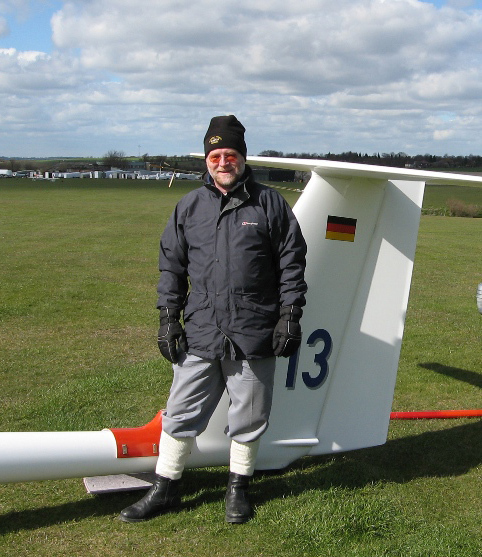 12-Mar Steve Rob Bourn Bourn Local 12:23 13:05 0:42 0 5 Steve first P1 flight. 12-Mar Rob Ed Bourn Bourn Bourn-BSE-Bourn 13:59 15:34 1:35 105 5 V cold, weak thermals under cirrus. 12-Mar Rob A May Bourn Bourn Local 15:49 16:32 0:43 0 6 Andy's first flight. 13-Mar Rob D Brown Bourn Bourn Bourn-RAT-Bourn 15:00 16:22 1:22 0 42 Clb to 5000, glide to Rattlesdon, Clb to 3000 and level cruise to Cambridge. Power on cct to GA, power on cct to ldg and T/O. Engine up/off ldg. 19-Mar Rob Steve Enstone Enstone Enstone-Brecon-Enstone 11:42 16:31 4:49 265 10 Strong NE'ly, tiptoed under 3000'cb to glide onto the Blorenge at Abergavenny. Ridge run to Pen-y-Fan, then into wave to 8500' Kept above cloud to the Severn. 8/8ths 30km out of Enstone so used engine to get home. 21-Mar Rob A May Enstone Dunstable Direct 13:10 14:58 1:48 78 11 13 comes home. Some 4kts in the Easterly gale. 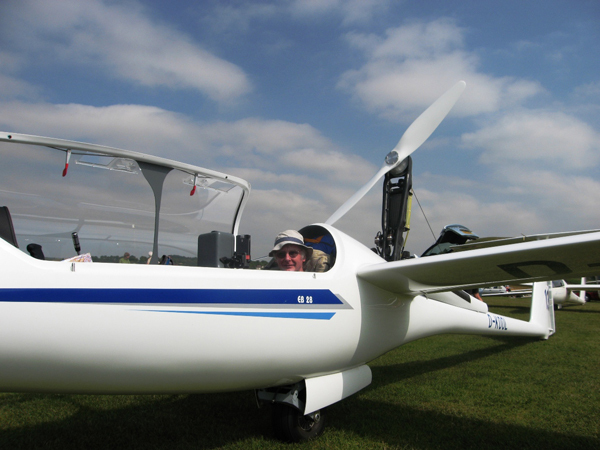 26-Mar Rob Dunstable Dunstable Local 08:08 08:32 0:24 0 4 First flight off Dunstable, 150m ROC 5.8, strong SW'ly. 26-Mar Steve G Lynn Dunstable Dunstable Local 09:48 10:13 0:25 0 5 First solo for Steve. 26-Mar Rob Steve Dunstable Dunstable Local 11:16 11:29 0:13 0 4 T/O from hangar ridge. 31-Mar Rob K Munslow Dunstable Dunstable Local 12:11 14:02 1:51 0 5 V windy, marginal hill soarable, some weak thermals. 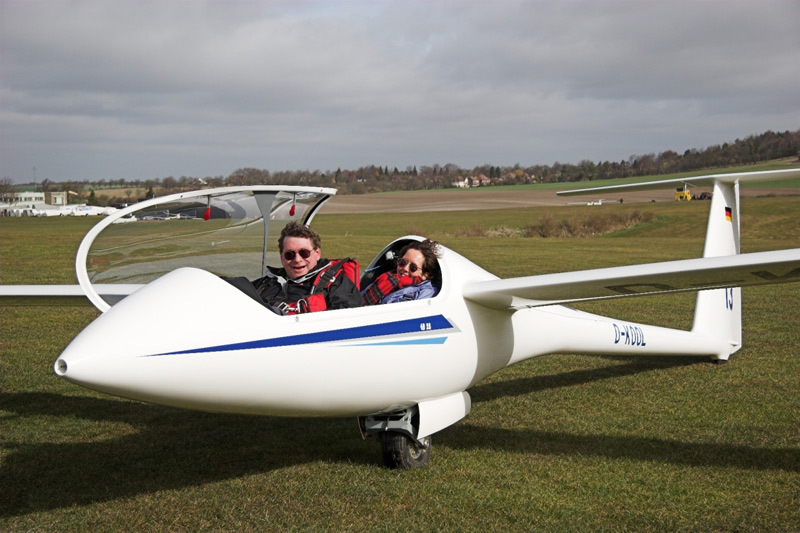 03-Apr Rob L May Dunstable Dunstable STS O/R 11:50 12:35 0:45 67 5 Laura's first flight. Good conditions. 04-Apr Rob J Slater Dunstable Dunstable LEZ-EDG-NYM-NOS-MAH-DID-BIC-DUN 12:16 17:14 4:58 456 4 Start with low cb of 2800, soon improved until 5000 then 6000 in centre of country, fringe areas were weaker and lower, shwrs in NE. Strong climbs 5kts typical. Wind NE/15. 05-Apr Rob P Harrison Dunstable Dunstable LEZ-BLD-KNI-LEZ 11:58 17:06 5:08 527 4 New UK 500k Triangle Record 505.4 @ 109.21kph. Moderate day 3.4 kt average. 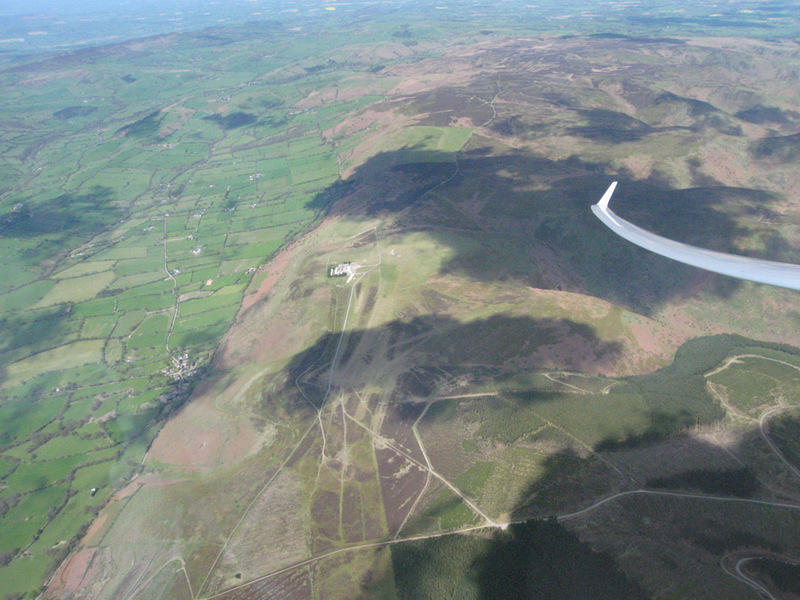 Excellent over Wales with CB upto 6000' Good fast run home with a convenient street. 07-Apr Steve Ed Dunstable Dunstable LEZ-PSE-SWE-DUN 11:17 15:47 4:30 277 6 Much clag & weak conditions on the way out to Cheltenham, then turned south to Cirencester & Swindon for sunshine. Streeting well in sw conditions & sunshine, pretty classic all the way home. 08-Apr Steve R John Dunstable Dunstable DUN-THM-WCB-EDG-DUN 10:46 15:08 4:22 226 5 Strong westerly & much of what everybody complained of as wave interference. Particularly difficult to centre past Kidlington (annoyed their Tower & Approach in the struggle past), and at Winchcombe called it a day. 10-Apr Steve Ed Dunstable Dunstable LEZ-BVT-LLC-LEZ 11:42 17:06 5:24 618 5 New UK 600k Triangle Record 601.3 @ 118.83kph. Low cloudbase to start but improved steadily to 5-6000asl. Some good runs on the first and last legs with 5kts available if you tried hard on the second leg. Some spreadout from about 100Km out on the way back but not really a problem. 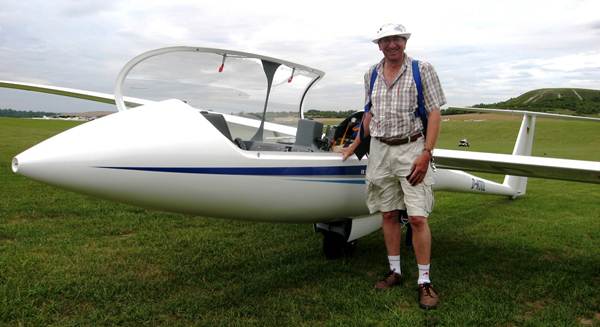 14-Apr Steve D Starer Dunstable Dunstable LEZ-WOC-LEZ 14:05 17:45 3:40 254 4 Took off at 1400 after a drizzly morning. Declared this one: LEZ-WOC-LEZ and did it. c 67kph out c 85 kph back. 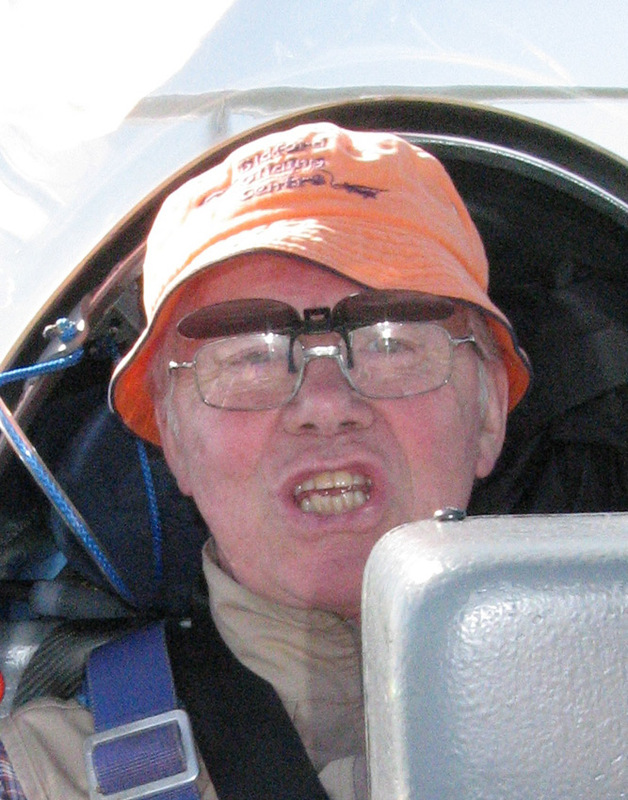 Max achieved was 5500', max 5kts, largely 3 kts, turned WOC to be faced with a deadish sky & drifted cautiously home. 16-Apr Rob Ed Dunstable Dunstable LEZ-RIV-GRM-LEZ 11:31 17:54 6:23 399 4 Fair soaring for awhile ahead of approaching front. Cloudbase got low around Swindon but was still just about soarable. Took glide to the Cotswold edge and slowly got into better conditions. Waited 30 mins for clearance to allow passage S of Birmingham. Had to find a cloud climb to get home near Northampton. Fascinating stuff. 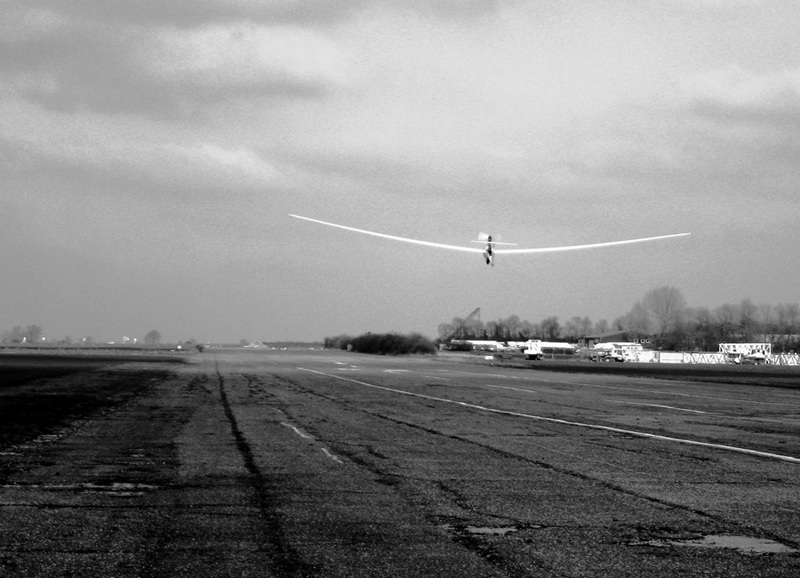 17-Apr Rob Ed Dunstable Dunstable DNS-SOA-TAL-GLS-TOW-DUN 11:19 18:05 6:46 428 11 High launch to FL55 for photo shoot. Then slog into 20kt wind. 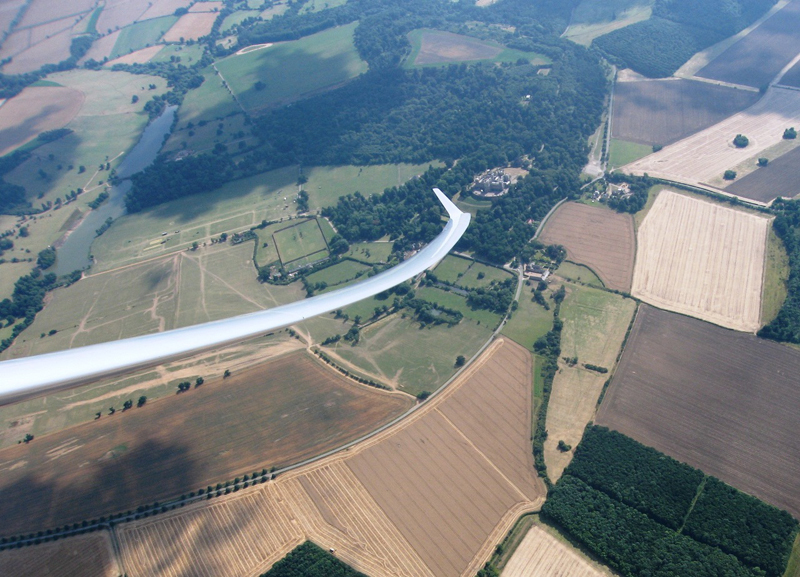 Glide across dead area terminated with a climb away from 800' over Stratford on Avon. Climbed to 5300' in wave over Severn. Street to Black Mountains, airbraked down to beat the ridges. Strange damp air clouds way below us past Gloucester. Interesting day/Great flight. 27-Apr Steve Ed Dunstable Dunstable DUN-BRN-PCT-DUN 11:40 17:23 5:43 430 9 Pootled v slowly (mostly below 3000') until c Peterborough when the sky started to open up. Gentle NW allowed us fairly close to the East coast. Some fab streeting for the last 20k & back. Returned into ever worsening sky. Engine start at Cranfield to get us home. 29-Apr Rob Ed Dunstable Dunstable LEZ-UTT-DEN-WOC-DUN 11:39 17:25 5:46 510 4 Slow start in weak conditions but slowly improved to very good especially around Severn valley. Tricky creep in /out of Denbigh with much lower CB. Not fast but interesting flight in areas rarely flown in. 30-Apr Rob Steve Dunstable Dunstable LEZ-ACL-MEN-NMT-DUN 12:23 16:27 4:04 373 5 Out of the clag and into a fantastic East Anglia with CB 5500 and 6kt thermals. Great view of the coast and Norwich City playing Wolverhampton. Final glide from Gransden back into the clag. 96.8kph. 01-May Rob Ed Dunstable Dunstable LEZ-PER-LED-SHO-Llanbedr-Portmadog-Cader Idris-DUN 11:18 19:11 7:53 558 67 Clearance after front. Timely cloudstreet with surprisingly high CB of 4000' gave a swift run to Cotswold edge into 20kt headwind. Used engine at Pershore to climb above cloud to find rather tricky wave. A further high level burn gave a glide to the Welsh coast near Llanbedr. Fantastic views, good thermals and ridge around Harlech and Cader Idris. Then further engine to climb up for a swift 250km glide home, with several wave top-ups on the way. 05-May Steve M Bird Dunstable Dunstable LEZ-MYN-HER-DUN 11:28 16:23 4:55 382 6 Broken thermals on first leg started to improve towards the Severn Valley, so too the blue gaps started to widen, with long glides en route to the West. Turned short at the Mynd and routed back via Hereford. 12-May Steve P Hurd Dunstable Dunstable LEZ-BOT-DOW-LEZ 13:03 17:49 4:46 330 7 Raced well out toward Northampton, after which it went largely totally non-soarable for awhile. 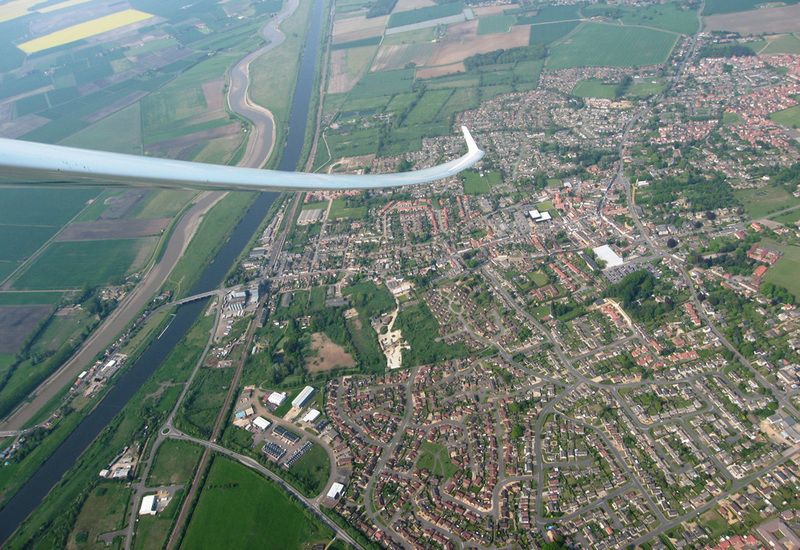 Market Harborough: took a 2 kt climb with gratitude, then poor glide to Melton Mowbray. 2nd leg, initially hopeful with climb to 6000' base, then nowt. Very intermittent after that, eventual climb at Huntingdon out of 2000' and a saving thermal kicked off by Bedford town centre to get us home EVENTUALLY! Very slow. Big wing day. 03-Jun Steve I Reekie Saal Saal Saal-Suhl-Bamberg-Schweinfurt-Saal 11:42 14:37 2:55 206 6 Saal grass soft, needed a push to start rolling. Take off downhill fine. Ride was no problem. Ony 3 of us flew as was not good, and landed in rain ealy pm. 04-Jun Steve T Hutchings Saal Saal Saal-Ebern-Kulmbach-Ostheim-Saal 11:17 17:11 5:54 418 9 Went SE to Ebern, then followed streets (across the wind) to Kulmbach, returning to Saal as the other guys were just starting to launch. Got to Ostheim this time, although wave/rotor interference from hills. 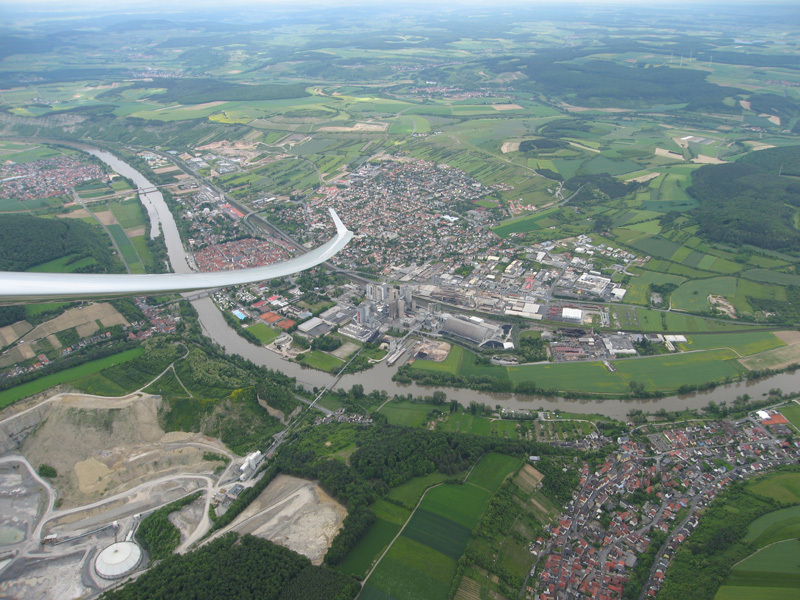 Good run downwind to Ebern again, then back N aiming for Dornberg. Struggle again in the lee of hills, then ok till conditions ran out 30k short of the turn. 05-Jun Steve P Wimmer Saal Saal Saal-Karlstadt-Bad Neustadt-Saal 14:11 16:58 2:47 197 5 Went to River Main between Karlstadt & Wurzberg, down south, after awful initial conditions. Street N/S brought us back to Bad Neustadt, then street E/W took us East of Saal by 20k. V o/cast initially, breaking up as afternoon went on. 06-Jun Steve D Lingafelter Saal Saal Saal-Karlstadt-Geisla-Saal 13:20 16:33 3:13 280 9 Lots of showers & big dead areas, tried to go SW first Should have turned back but wanted to run down the Main towards a big shower, turned around (Markt Retzbach) & air was dead, so had to have a burn at Karlstadt. Turned north, avoiding showers & lots of that going up the front of the cloud stuff like you do with big showers. 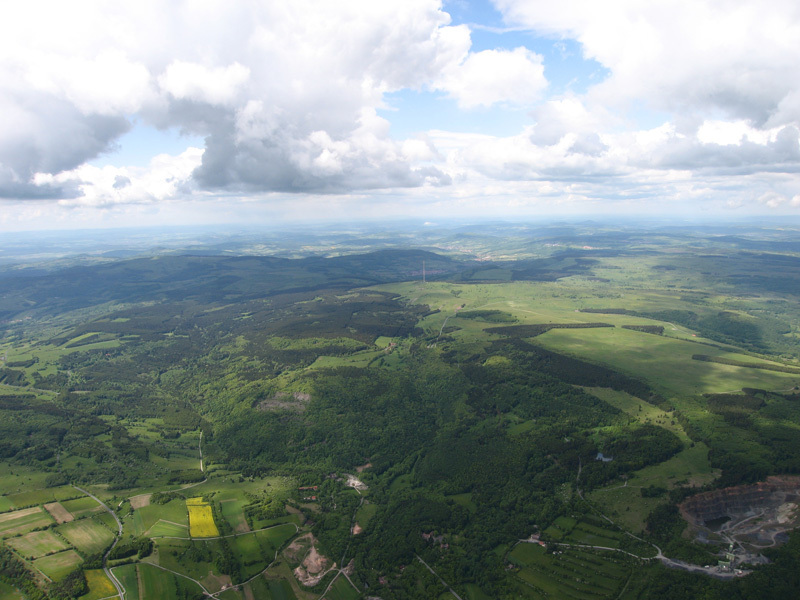 Cloudbase rising over the Wasserkuppe, continued North (up to 7500') until conditions ran out at Geisla (NE of Fulda). 08-Jun Steve M Birch Saal Saal Saal-Geisen-Eisenach-Saal 12:42 16:02 3:20 326 6 Got bogged down in the middle after 1st tp (Geisen), 2nd tp Eisenach. Several 8kt climbs, one over Rhon moumtans peaked at solid 10 & a bit of 11. 09-Jun Steve T Manwaring Saal Saal Saal-Grif-Tirs-Gotha-Saal 11:12 18:30 7:18 631 6 2nd attempt at 750, this time up & down the Turingerwald. Cirrus into 2nd tp slowed us down considerably, and heading NW after 5pm the cu/lift died out rapidly, so cut & run. 11-Jun Rob Ed Saal Wiener Neustadt Direct via Bayreuth and Czech border 10:46 17:52 7:06 576 6 Totally blue start, with convection to 5000', few small cu around Bayreuth. 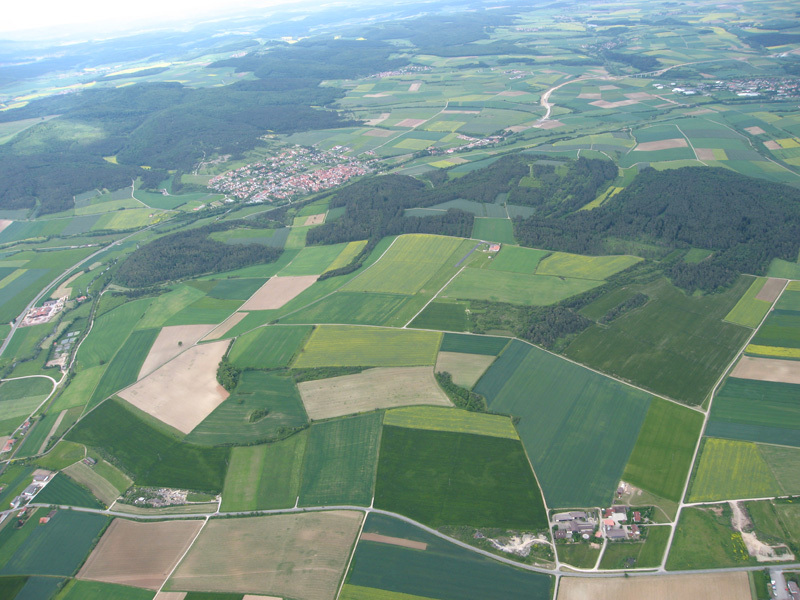 Some decent cu over the Bayerischerwald with base rising to 7000' Dodge round airspace to reach Wiener Neustadt. 12-Jun Rob Ed Wiener Neustadt Wiener Neustadt Timmel O/R 10:06 18:55 8:49 824 10 Attempt at 1157km record flight to Oberalp Pass and return. North side of main divide remained blue for a long period, routed South both ways but slower. Max ht only 12000. 3.5kt average. 13-Jun Rob Ed Wiener Neustadt Wiener Neustadt Oberalp Pass O/R 09:19 20:31 11:12 1162 27 2nd Attempt at 1157km record flight. This time a better day insomuch as thermals averaged 4.1 but all very rough and broken due to opposition of sun/wind. Extremely hard work. Averaged 107.6 kph, enough to complete flight but thwarted by spread/rain band over Eastern Austria. Forced to abandon after 1084 kms. 14-Jun Rob R Colbeck Wiener Neustadt St. Johann Wnr Neustadt-Gerloss Pass-St. Johann 13:47 18:51 5:04 402 8 Late start due Paj probs. Weaker than previous days but pleasant enough. Led to a good photo session on the top of the Kitzbuhler Horn. 15-Jun Rob Ed St. Johann St. Johann SJ-Lesce Bled-Timmel-Niederoblarn-Kufstein-SJ 11:29 19:12 7:43 833 11 Good looking day, try for big OLC and varied route. Not disappointed though thick cirrus over Switzerland stopped Westward progress. Base to 15000' along S side of main divide. South of that, damp air from South cut off soaring there after our earlier visit. Early cut off due cirrus. Great flight though. 16-Jun Rob R Colbeck St. Johann Wiener Neustadt St. Johann-Wiener Neustadt 10:51 15:44 4:53 311 25 Storms threatening, left early for reposition to Wiener Neustadt. Found first thermals just starting E of Zell am See, ran Dachstein and Grimming to Trieben valley. Stumbled on wave S of Eissenerz and climbed to 13500'. Big Cbs blocked Semmering for awhile but eventually crept through talking/squawking to Wien. Vis on East side atrocious. Derigged. 03-Jul Ed Rob Bicester Bicester BNW-PPL-BWL-BNW 13:03 17:13 4:10 435 8 New UK 400k Triangle Record 406.7 @ 116.24kph. Good first leg - one thermal to almost the first turn, then became more difficult with decent stuff very hard to find. Kept going and conditions improved further N; still required patience and lots of fiddling to catch a reasonable climb. Headwind on way home but pressed hard and got 7kts 25km out which sped us up a bit. 09-Jul Ed Steve Bicester Bicester BIC-WAL-CAL-BIC 13:57 19:13 5:16 301 26 Launched out of BIC into a stiff westerly. Trouble getting away, so took an engine burn to find wave which then failed (wave not engine). Eventually ran a conventional street to Bidford & did a thermal-wave climb in the lee of Gt Malvern which took us at 2-5kts to 12000'. A bit scrappy after that. Turned for home from 12000' NW of Shobdon. 11-Jul Rob A Roch Bicester Bicester BIC-HEC-ELY-BIC-LED-BIC 10:52 17:21 6:29 616 5 Post cold front but blue forecast. In the event 3-4kts to 4500 and good cu with a few blue areas to finish. Not the easiest of thermals but made up with some nice runs. 3kts average for day and just over 100kph. 12-Jul Rob S Carmichael Bicester Bicester BIC-NES-BIC 13:50 16:05 2:15 145 5 Hot, blue and weak. Not too much fun though checking out the top of Didcot chimney saw two blokes sat on the top eating their sarnies who gave us a cheery wave! 13-Jul Rob J Corpe Bicester Bicester BIC-NLE-WOG-OUN-ILS-BIC 13:01 17:21 4:20 350 5 Post front, band about 50k wide with good high cu, blue to North, overcast to South. Flew the band West until cramped by Brize then East to Oundle. Soarable beyond but much lower cloudbase. Back to didcot+ to finish. 14-Jul Steve P Rackham Bicester Bicester BNW-MOM-MYN-BIC 11:16 16:42 5:26 325 11 Conditions at MYN were pretty grim. Very broken, unreliable & blue. Took an engine burn up to 5000' after which we had much better air, and a good run home. 16-Jul Steve T Rose Bicester Bicester BIC-ABE-SHO-BIC 11:45 17:47 6:02 333 6 One of the lowest slowest 300's known to man. 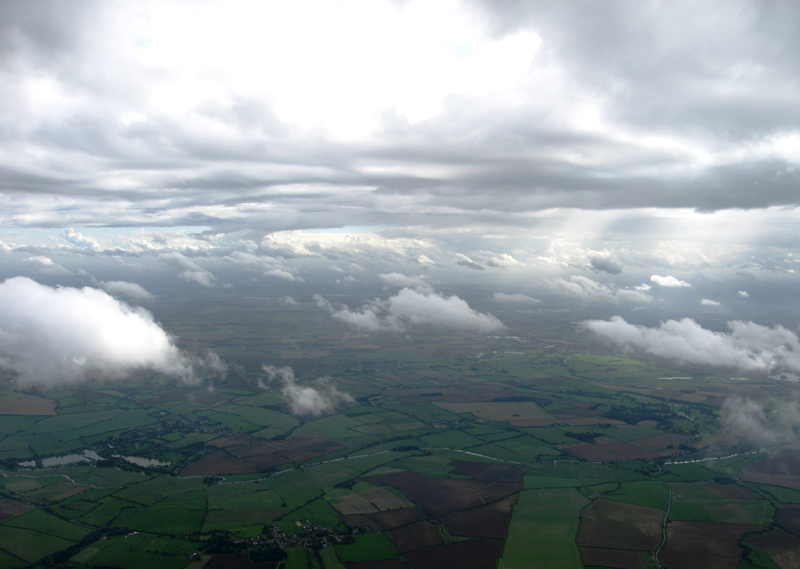 Once over the Cotswold Edge, it got even lower, rarely much more than 2000' over the ground. Totally blue with cornfields working better than towns. Big grovel downwind of ABE on east facing slope below hilltop height. The parascenders stopped flying to watch, eventually turned & S-turned my way above the hill, and then had a better run up towards SHO. Then at first the run home into wind was promising, but got progressively back to the true nature of the day by time I got to Gt Malvern. Headsets passed forward twice in the flight with anticipation of a burn - but avoided fortunately. 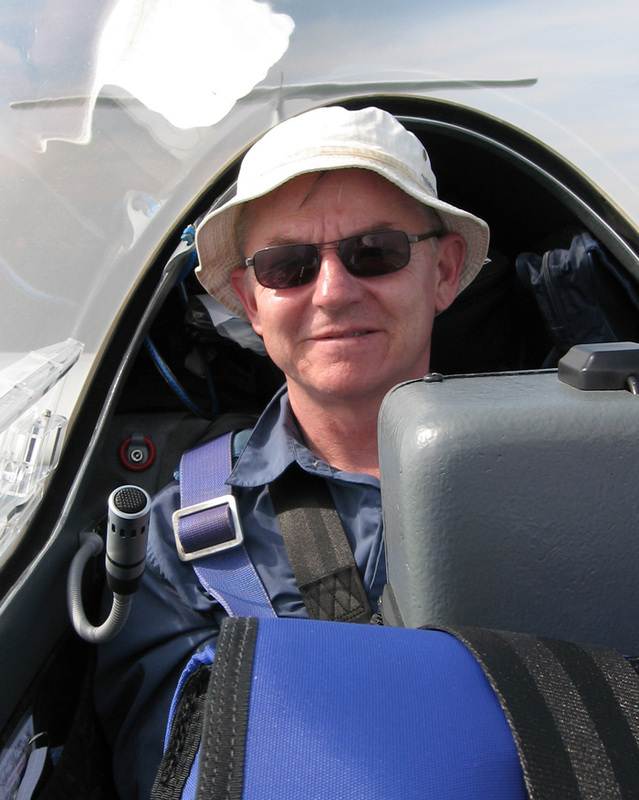 18-Jul Rob P Watson Bicester Bicester BIC-KGS-SWS-WNG-BIC 14:18 16:55 2:37 223 4 Hot and blue but broke through 3500 as we launched to 4500 and then rose to 5000 with a few 3-4kt thermals. Didcot gave us 6-7kts to 6800 on the second visit. Sfc temps 33. 19-Jul Steve R King Bicester Bicester BNW-WPL-BNW 13:06 17:37 4:31 404 5 Wanted a shot at the 300k o/r, which needed us to achieve + 121kph. In the event, couldn't better 111kph, as it was a bit blue to start with and took a number of 4kt climbs, whereas the flight delivered 6-7 knots on the return leg, with a super 70k final glide from 8500'. Answer - start later on such hot high days by working the end game backwards. 23-Jul Rob P Hunt Dunstable Dunstable LEZ-SNO-AST-LED-DUN 14:42 18:39 3:57 292 5 Started in a weather front with cb 3000asl, this lowered progressively to 2300asl near Oxford. Cloud climb to 2700asl to cross a gap to Abingdon then base rose nicely with each climb to 5500 and some nice climbs too. Fascinating stuff. 28-Jul Steve A Gibbs Dunstable Dunstable LEZ-LRI-NOS-NWK-DUN 11:32 16:53 5:21 411 6 Set off early with base not more than 2200' agl. V slow improvement into the Cotswolds. After leaving the Edge, the air became decidedly worse, turned Evesham with the intention of going for Aston Down, but the poor air coming up the Severn made us run for the cu at Little Ris. Then really good run back down the cu to NOS, left turn and a reasonable blast North. Good climbs, good depth: 2500 - 5200' QNH. Could have probably gone further North, but turned Newark for a nice 400k. 29-Jul Steve A Harrison Dunstable Dunstable LEZ-BYT-DUN 10:29 15:36 5:07 337 19 Dec Dishforth o/r, but encroaching front from the West brought top cover, and then started to encroach from the North. Turned back around Retford, then getting forced East for sun all the time. Thermals difficult although occasional 5-6 kts, likely wave interference. Last climb off the steel factories at Corby before glide to Sywell, started engine for climb from 500' to 5000' to get home. 04-Aug Steve I Reekie Dunstable Dunstable DUN-BLY-SIL-LRI-DUN 13:42 17:07 3:25 182 5 Pootled low under 7.5/8 to STS, SIL, LRI, and back around the circuits at Kidlington & then Bicester. (Oxford Tower offering advice on where to find the cu was probably the most polite "bugger off" I've met). Amazingly achieved 180km out of a hopeless day. 05-Aug Steve G Lynn Dunstable Dunstable LEZ-MAH-ELY-OLN-DUN 11:17 15:00 3:43 265 5 Poor first leg North, largely below 3000', turned MAH & headed for circuit at at HusBos, got away and then blued up on the run East, and improved in the process. Ely is my personal demon, and it was blue, which I can't take, but I heroically fought off these adversities, and we had a pretty good run back into an ever improving sky. 07-Aug Rob A May Dunstable Dunstable LEZ-EYE-SYW-CHL-DUN 14:53 18:24 3:31 306 4 Launched into clearance behind front. Base 4000 locally but dipped to 3000 at Corby, much lower N and E. Ran almost without circling to Edgehill then weak round CHL. 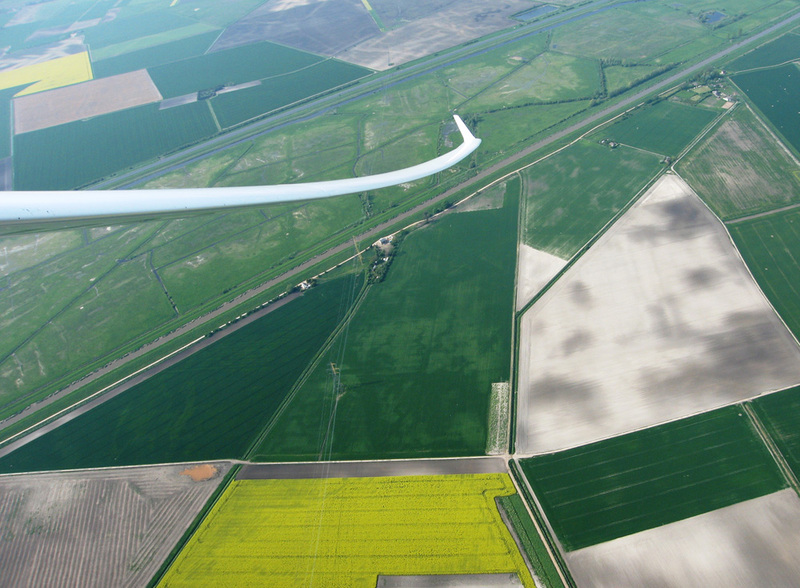 Increasing headwind and weak climbs on last leg spoiled an otherwise fast flight. Club at Nympsfield and Regionals at Bicester all scrubbed!? 08-Aug Rob C Withall Dunstable Dunstable LEZ-WES-ELK-DUN 14:29 17:53 3:24 302 3 Billed as a classic but much high cloud cut off or weakened large areas. Blue and weak around Colerne so turned back early. 09-Aug Rob Dunstable Dunstable LEZ-COB-RAM-CHN-ABN-DUN 13:48 17:45 3:57 314 3 Very windy, followed weather as much as possible, but SW was better. Bases rose to 6000 around Oxford. Wave influence. 11-Aug Steve Ed Dunstable Dunstable DUN-OSW-ROS-MYN-DUN 11:30 17:44 6:14 567 4 Up the West of Birmingham to turn back at Oswestry, and good run to ROS, and then back to the Mynd with minimum circling. Returning home, we met clag towards BIC for a cautious final glide. 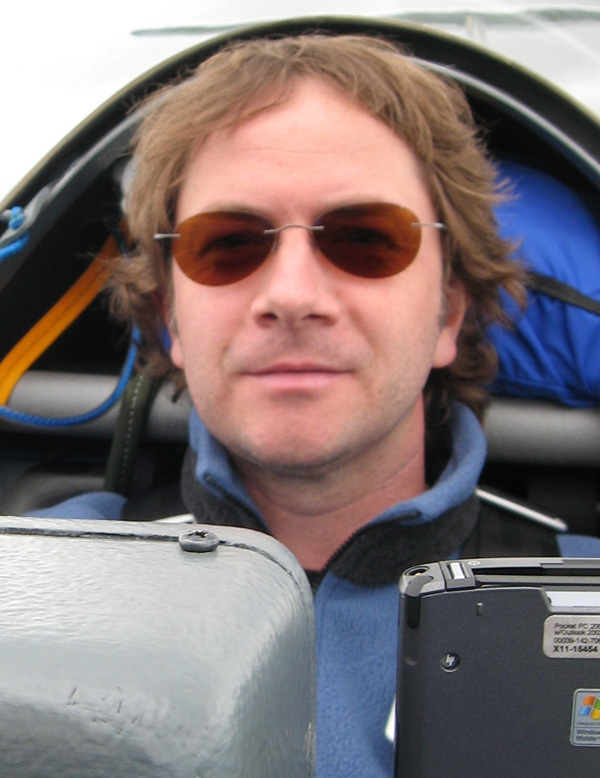 20-Aug Rob S McLaughlin Rieti Rieti Around Rieti 15:22 18:10 2:48 167 8 Local exploration, only weak lift available. 21-Aug Rob A May Rieti Rieti Cantalice - Campoli - Gualdo Tadino - Lago Ripa 12:19 18:21 6:02 412 9 Slow start with other competitors by grinding up to 10000' in wave before the start. Ran Campoli ridge too high and took too much height on Northern ridges, nevertheless an enjoyable day and first look for Andy. Task: 378.3 @ 103 kph. 22-Aug Rob S McLaughlin Rieti Rieti Campo di Giove - Nocera Umbra - Lago Ripa 11:44 18:34 6:50 650 8 Great start on back of Terminillo with 8-9kt lift to 8800 then fast run E of Velino. TP1 looked difficult in blue hole and sea air on nearby mts. 3kts over turn saved the day. Sea breeze at end of Morrone ridge followed by fantastic run along Gran Sasso to Gorzano and onto Vettore, job done rest was ridge run home. Another 200k with Shaun flying followed. Best day of the week. Task: 346.9 @ 124.58kph. 23-Aug Rob A May Rieti Rieti Rieti Ospeda - Pescasseroli - Norcia - Acquaspa - Lago Ripa 12:10 16:34 4:24 345 9 Classic first leg; 2 thermals at 4.7kts at key points, then another strong climb to reach Velano at the right height for 4th strong climb. Then fast run to N end of Gran Sasso. Weaker climb at Norcia and nearly blue home. Could probably have done it 7kph faster without turning after Norcia. Andy did all the flying just a few suggestions from me. Good training for Andy, absolutely wapped the locals! Task: 308.1 @ 131.43kph. 24-Aug Rob A May Rieti Rieti Cantalice - Campoli - Valle Longa - Gran Sasso ridge - Amatri 12:34 16:40 4:06 317 7 Low cloud to start, but improved for great run to Valle Longa and back to Gran Sasso. Then thick middle cloud caused us to abandon task and explore first the Gran Sasso ridge then wave to 10800' uncomfortable final glide in rain. Useful for Andy again. 08-Sep Steve Ed Bicester Bicester BIC-OAK-Ipswich-Colchester-MRM-BIC 11:41 17:02 5:21 435 6 Blue to most directions apart from NE. Eventually we went due E to the coast at Ipswich with reasonable streeting. Then South to Colchester, then back inland to Marham at 1530 for a cautious flight home. Ed put me low at ELY to fight my demons & I won (momentarily), Ed found a great climb at Bedford as it was finally blueing out for the day, for a gentle run back to BIC. 15-Sep Rob T Rose Dunstable Dunstable SIL-BUC-OLN-PRI 12:45 15:45 3:00 120 19 Essentially local with 15kt Northerly and 2500' base, but bits of wave above. Tried inflight start cold and hot, both without problem. 17-Sep Rob Ed Dunstable Dunstable DID-SNO-DID-BIC-OLN 12:50 16:32 3:42 239 10 Blue to start with weak front approaching from W. Low out to Oxford then small burn to contact 5kts near DID. Ran into overcast with 2,000' base at Swindon, then came back into better conds between the blue further east and the clag. Unexpected and enjoyable. 19-Sep Ed B Craig Dunstable Dunstable Brecon O/R 11:53 16:44 4:51 412 6 Launched into 20kt WSW just as convection was starting. Struggled a bit to begin with but picked up with good streets at 4,000ASL. Followed energy lines past the Malverns, little bit of wave then large street up the Usk Valley to BRE - strangely blue to the N. Beat up Pen-y-Fan then returned home over the top of the Black Mts. Best climb peaked at 7.5 to 5,600'. Cracker for late Sept.
30-Sep Steve T Pridgeon Dunstable Dunstable AYL-SYW 11:24 13:32 2:08 122 17 Drifted downwind with the weather until it was guaranteed we couldn't get back, so started engine at Sywell, then got rained on in final glide & had to take another little burn to get in. 03-Oct Rob L Duhaney Dunstable Dunstable MOR-NYM-DID-STK 10:42 15:49 5:07 328 42 Attempted a power flight to Talgarth. In the event a very cloudy day, some wave, some thermals and several ridges explored. Very congested and low base West of Severn so turned back at NYM. 07-Oct Steve Ed Dunstable Dunstable HER-PRE-CRY-BLY 10:32 17:35 7:03 438 33 2 engine burns to the Cotswold Edge, for the first sub-cumulus soaring of the day, scrappy with wave mix. Cloud shadows suggested wave there, but couldn't connect. Valiant thermal struggle after Gt Malvern got us waffle SE of Hereford, into blue led to 6 kts and revealed an otherwise unclear wave gap. Stepped forward in stages to Radnor, then turned south to join the LGC expedition at TAL. Best height nr Cray was c 10.5k'. Took a few weak top ups in diminishing & lowering wave bars back to the Edge to ensure glide home. 15-Oct Ed R Colbeck Bicester Bicester BIC-TAL-LLW-TAL-BIC 12:13 17:10 4:57 353 27 Climbed through thin overcast, then downwind glide over 8/8 to Talgarth. Excellent E wave over site - pushed north but not much happening. Topped up to FL125 then started 150Km slog into 35kt wind... Amazingly, there were long lines of reduced sink running almost directly upwind; climbed a bit at Cheltenham, still not enough for Bicester. Again, there were energy lines, just enough to stretch the glide and these continued as we went through the clouds. Incredible we didn't have to use the engine to get back against such a wind - a really interesting and worthwhile flight!